BD&E’s Custom Case Workshop is well known for its superior teller counters. Our teller counters are also designed to integrate perfectly with your security systems. Our Design-Build team are experts in Security by Design, which enhances the safety of customers and employees without sacrificing aesthetics. The Custom Case Workshop is BD&E’s mill working division. 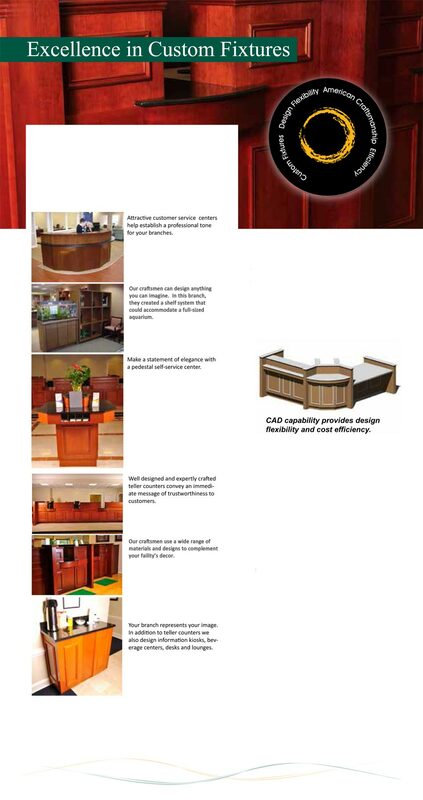 Craftsmen create outstanding American designs for teller counters, fixtures and furniture. With them, excellence is assured. BD&E is the only financial operations company that offers the design efficiency of a dedicated team of woodworking experts. Artistic vision is rooted in making the practical beautiful and making the beautiful useful in both its form and spirit. Excellence in design sets a tone that helps your customers embrace your financial institution as a partner they can trust. Customers expect design excellence the minute they walk in your doors. Is it time to upgrade your lobbies and teller counters?